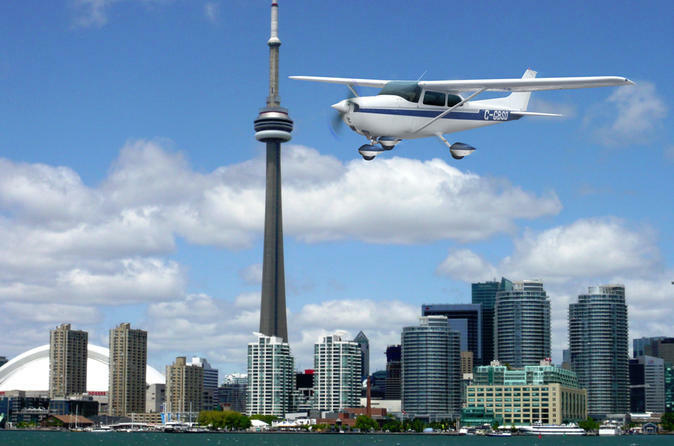 Take a 30-minute air taxi from Toronto Island Airport to Niagara District Airport. If your time is limited, save yourself the frustration of a 4-hour drive to Niagara. Instead, enjoy the spectacular sights from the air as you fly from Toronto Island Airport to Niagara District Airport, along the shoreline of Lake Ontario, the Niagara Escarpment, and Niagara Falls. This package includes a one-way air taxi for one to three (1-3) people from Toronto to Niagara, a Niagara Falls air tour, and ground transportation from Niagara District Airport to all Niagara hotels (approximately a 15-minute drive). This fun and exciting air taxi ride follows the shoreline of Lake Ontario, past Mississauga, Oakville and Hamilton, and along the Niagara Escarpment. Enjoy an airplane tour of the world famous Niagara Falls! See everything from the air, and then spend a day or two exploring beautiful Niagara on the ground. Your package includes a one-way air taxi for one to three (1-3) people from Toronto to Niagara, an air tour of Niagara Falls, and ground transportation from Niagara District Airport to Niagara hotels. After pickup at Billy Bishop Toronto City Airport, fly to Niagara District Airport, where you'll be transferred to your hotel in the Niagara area. Flight times are flexible. You can choose between multiple air taxi departure times from Toronto, and you can call your tour operator to make special departure times at your request.